Whichever expertise level you are in, it is extremely difficult to find a longboard that performs to your heart’s content. You need ease of riding, speed, and swiftness all in one. Alongside, durability and versatility. All this at an affordable price as well. It may actually seem more difficult than it is. In fact, we are here with a thorough review of the Santa Cruz Longboard Decks complete. Because you are already here, at the right place. Apparently, with this Santa Cruz Longboard Decks review, you will know close to all there is to know about it. We may not convince you to buy it but you will still find out what features you want in your longboard. Santa Cruz is a well-known brand for producing quality longboards, assures you of the quality of its brand integrity. In fact, all the parts of the longboard are manufactured by Santa Cruz themselves, with their material, craftsmen, machines, and designs. Therefore, you can let go of any doubt about the durability and finesse of the boards. The Lion God Rasta Freeride Longboard deck is neither too large nor too small. It’s the average, perfect size. Whether you are a kid, an adult, a beginner, an expert or anything in between, this longboard comes in the perfect size for you. In fact, it has a length of 40 inches and a width of 10 inches. Convenient, right? What makes it even more assisting, is its mentionable lightweight. It weighs only 7 pounds! Whenever you are tired of gliding through the crowd, just carry it in your hand. It won’t tire you any longer! The design, the size, and the wheels, everything will mean nothing without the deck being sturdy and efficient. Luckily, the Santa Cruz Freeride longboard deck adds value to everything else by making its deck the most spectacular component of its being. In order to assure you with durability, stability and also comfortable with its 9-ply Maple wood layers! Yes, 9! So, if you are a beginner and mess up your moves sending your longboard flying off too often, don’t you worry, child! Because it will happily stand your struggles and torture. 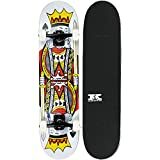 Apart from that, this deck also lets you have a better control of the board with its black Santa Cruz Grip Tape with Rasta Stripes. Unlike most other longboards, the Santa Cruz Lion God Rasta Longboard has wheels with larger diameter and parts. Even with a diameter of 75mm, the Road Rider wheels are quite soft and offers smooth performance. Moreover, the 31-inch wheelbase provides riders with greater stability and also speed. You can balance your board better during speedy downhill rides. In addition, the Road Rider 180 trucks are good at both absorbing shocks and minimizing rough street effects. The material of the wheel and its other parts being soft reading 78A on the durometer make carves, turns and shifts easier. You get the greatest control on your rides with these wheels. Lastly, the ABEC79 rated bearings make the longboards performance even better. This style definitely makes your downhill rides easier, safer and tractable. The closer to the ground deck, large wheels, all this has been made to help your cruising. However, this longboard is not suitable for doing tricks due to its lack of the required features. Ride with ultimate style with the Lion God Rasta Freeride Longboard! 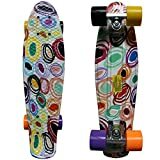 This longboard definitely gives off a stylish yet funky vibe that makes people praise your choice. The Lion God Rasta peeking from your longboard is what makes this longboard so unique in an aspect of its designs. The other parts are also coordinated with the deck so the longboard has a good combination of colors overall. ♦ Quality-assurance through the brand integrity and image. ♦ Durable and clever longboards. ♦ The deck that helps to ease rides and provides greater control. ♦ Parts that disappoint can be replaced easily. ♦ Large wheel and all wheel components provide greater stability. ♦ Great for downhill rides. ♦ Unique and alluring Lion God Rasta Design. • Not good for doing tricks. • The bearing might have to be replaced for maximum performance. • A few boards arrive with bubble underneath the grip tape which is, in fact, a manufacturing defect. But, it can be solved easily. ∗ Is this board good for cruising around the neighborhood? Answer: Absolutely, yes. It is not only good for cruising around your neighborhood but also for going longer distances. 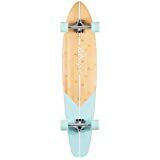 As a matter of fact, the larger wheels with the overall construction make this longboard great for cruising. However, there are limitations on the tricks you can do with it. ∗ Is this board alright for a person of 6 feet 3 inches who weighs 230-250 pounds? Answer: Yes, you will face no trouble at all riding this sturdy masterpiece. Apparently, Its size will be in perfect harmony with your body as well. ∗ Is it normal for the longboard to creak a lot? Answer: Apparently, yes it is. It’s actually the trucks creaking because of being stiff. You can just lubricate it to get the breaking off. ∗ Do I have to assemble it? Answer: Nope, it comes completely ready for use. Just open the box, take it out and use! Now, if you are looking for a great longboard that will accompany you for years, not tire you, provide you with smooth rides, easy control and make you look great as well, The Santa Cruz Lion God Rasta Drop Thru Cruzer Freeride Longboard Deck will be the perfect way to go. Of course, the board has a few drawbacks but they are nothing compared to the service it provides. As a matter of fact, in the end, it is completely up to your choice and style, if you want it or not. Hopefully, through our Santa Cruz Longboard Deck Review, you have already found the answer to that. Therefore, our role ends right here. We will be back with more! I’m working in IT related field more than 10 years. I’m expert in Webpage develop by WordPress ꙮMailchimp Email template ꙮCreate subscription or signup form ꙮLead collecting form or Pop up form ꙮFacebook pixel & Facebook for Woocommerce ꙮLanding page creation ꙮCreate Blog or News website ꙮTestimonial Slider & Google map setup ꙮ Woocommerce Setup ꙮAccordion Pricing table etc. I’m also an expert in ꙮOracle Database installation and configuration.I’m also doing ꙮeBook formatting in pdf. Design eBook cover and thank you page. I’m also expert a ꙮExplanation video maker.